San Francisco Ballet’s third mixed programme at Sadler’s reinforces the positive impressions made already in this visit. The Artistic Director, Helgi Tomasson, has a very shrewd grasp of how to present the company. The timing of the visit is ideal. After a summer without any major visiting companies in London, there is a ballet audience keen to buy tickets for live performances. 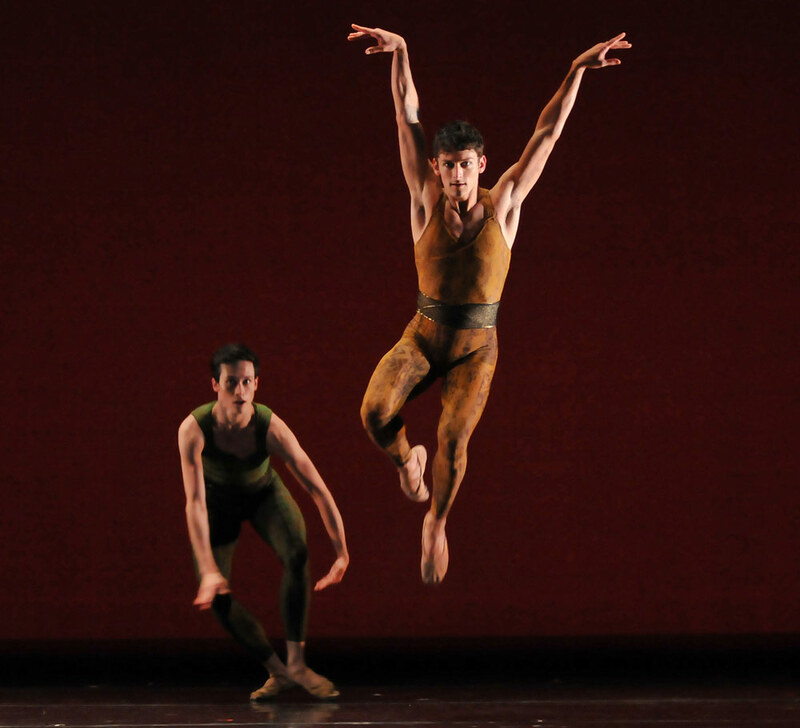 Tomasson knows how to commission works that show off his dancers at their best. There is trust built up from earlier visits (though eight years has been too long!) so that even if there is a work on the bill that may be less appealing, you can be confident that there will be something else to like or even adore. Above all the dancers are energetic, speedy, and look as if they love every single minute on stage. Although they have the cohesiveness of a company, different individual characters within the group shine out strongly. This programme included four works, all made in the last four years, new to London. On previous visits SFB have brought us a number of Mark Morris works which have had immediate audience appeal, for example the cheerfully goofy Sandpaper Ballet. Beaux is Morris’s eighth work for SFB, and this one is more of a puzzle. It is set to harpsichord music by Martinu. Morris uses an all-male barefoot cast of nine, clad in simple camouflage-patterned costumes – though these are a striking mix of pinks. The backdrop repeats this pattern, though the lighting shifts it from pink through shades of orange and blue. The mood of the piece is hard to pin down: at times it is quite boyish and playful. The guys make beckoning gestures to each other as if to say come over here, join my gang, and form a little huddle. Three of them make gestures as if playing a version of paper, scissors, stone. At one point the dancers run hand in hand: this brought back a sudden sharp memory of 8-year-old boys running just like that in our school playground, in an innocent age where they would scorn to have anything to do with girls. But then they would also definitely have scorned to wear pink. The mood isn’t really so childlike – more of an adult’s memory of what boyishness was like. But as a contrast to that there are now and then some group poses and pretty little steps that wouldn’t look out of place for a female corps in a 19th century ballet. Men partner men extensively in lifts and turns, as they would partner women or as women might be partnered. Hans van Manen experimented with male-on-male partnering a few decades ago, but Morris’s take on this is more idiosyncratic. Beaux plays with the idea of how masculinity is represented in dance, or how the audience thinks it should be. Here the men are lifting men or being lifted through the air, dressed in pink. How, Morris asks, should a male role be defined? The audience’s reaction was subdued and perhaps mildly bemused. Maria Kochetkova and Hansuke Yamamoto in Possokhov’s Classical Symphony. Yuri Possokhov’s Classical Symphony, set to Prokofiev’s work, had much more immediate appeal to the audience. The music is familiar, accessible and highly danceable. Its only issue might be its over-familiarity – it is a popular choice for choreographers. (it was used here in July for a new work for New English Ballet Theatre). Possokhov works in a more classical style with a recognisable hierarchy: a leading couple supported by two other couples and a corps, the women in tutus. San Francisco Ballet in Possokhov’s Classical Symphony. The leading couple of Maria Kochetkova and Hansuke Yamamoto are put through their paces with fiercely challenging jumps, spins and some tricky partnering. Although the language is mainly classical there are odd off-centre moments, with dips and sideways lunges to add unexpected moments of distortion. Maybe this is intended to signpost that this is a modern take on classicism but some of it is less successful. The dragging of the female dancers along the floor looked laboured and ugly. The attractive speed and vivaciousness of the dancers sometimes came at the cost of accuracy. One all-male section looked less precise and cohesive than was surely intended. This might be a minority view as the audience loved the piece and gave a particularly warm reception to its two leads. Maria Kochetkova (with Hansuke Yamamoto) in Possokhov’s Classical Symphony. RAkU, also by Possokhov, was a surprise, a contrast to the majority of the bare-stage, abstract works that make up the bulk of SFB’s programming on this engagement. RAkU is a narrative work, with a stylised Japanese setting, invoked simply but effectively by way of black and white projections of pavilions on screens. Spareness and minimalism are its hallmark. The story is pared down to its essentials, with just three characters and a chorus of four warriors. There is a woman, her man who goes away to his death in war, a rival suitor, assault, flames and death. The vocabulary borrows from the conventions of Japanese theatre in terms of formality and stylisation but remains rooted in ballet. Shinji Eshima of SFB’s orchestra supplied specially written music, relying heavily on oriental percussion effects. Yuan Yuan Tan in Possokhov’s RAkU. The work is a great vehicle for Yuan Yuan Tan to unfurl her impossibly long limbs, to demonstrate her graceful fluttering of a kimono sleeve, and to collapse to the floor in exquisite longing. It’s a committed and elegant performance but the work as a whole was cool despite its professed invocation of burning desire and impressive rather than emotionally involving. Christopher Wheeldon’s Within the Golden Hour provided a more lively and upbeat conclusion to the programme. Wheeldon uses music from Vivaldi interlaced with more contemporary pieces from Ezio Bosso. This mix was more coherent in performance than one might initially imagine. San Francisco Ballet in Wheeldon’s Within the Golden Hour. Here was a return to abstraction and to a purer classicism, with the stress very much on the couple. There is a corps of four couples and three lead couples, each of whom gets a differently accented and contrasted pas de deux. The first is playful and sunny, the second slow and lingering. The most interesting section was where Wheeldon stepped outside what seems like a very standard male / female couple structure and gave us a section for two of the men of the corps instead.